Northern Ireland: I have never seen so much green in my entire life. Northern Ireland was beautiful. I visited several locations were they filmed Games of Thrones, and the food was really good. I thought that Peruvians could do potatoes… until I tried the Irish ones. Cambridge: Cambridge was my favorite day-trip from London, and it’s a place I’d definitely visit back. The colleges are amazing (worth the entrance fee), and the campus is beautiful. Oxford: this was also a day-trip from London, but I didn’t like Oxford as much as I liked Cambridge. The campus has amazing history, and I enjoyed the free walking tour I took, but the combination of SO many tourists, and crowded places made Oxford not my favorite day-trip. Stonehenge/Salisbury: I was hesitant to visit Stonehenge but I’m glad I did. I took a train to Salisbury from London, and took the official Stonehenge tour bus that takes you to Stonehenge. The audio tour was good, and I was able to learn a lot. Salisbury is beautiful and walking to the cathedral was very nice. Doing day-trips by train without a tour: the U.K. is very small, and the British are extremely serious about their trains and their punctuality #NotPeruvianTime. Trains depart every hour to the main cities, and it gives you an opportunity to get away from the city and see rural areas. Use Trainline to book your train tickets (I traveled non-rush hour to save money too! ), and avoid using tour agencies to do day-trips. Once at the destination, you can do free walking tours, get a hop-to-hop bus, and enjoy your time there. I arrived around 11am to all my destinations, and I was in the train back to London by 5pm. It gave plenty time to see each city, and be back in London for dinner. Free walking tours: I am a big walking tour fan. I dislike tour groups, but I feel like a learn a lot by listening to a tour guide, so free walking tours are my solution. My favorite this time was Sandemans. They have them in different cities in Europe too! Free walking tours are not really free. It is expected that you tip at the end of the walking tour. Buy groceries at Tesco: once you work for Walmart, you go around the world going inside supermarkets and appreciating them #LatinMoment, so Tesco was one of my places to visit while in London. I LOVED Tesco and all the products they offer. Their vegetables section was my favorite, and they have very good lunch meat, bread, and excellent prices. Even if you’re not cooking during your trip, buying water and snacks here will save you some money. Another excellent supermarket is M&S, a little bit more expensive but with excellent chocolate and biscuits #OMGtheChocolate! Pack your lunch: I quickly found that the U.K. was pretty expensive, specially food-wise, so I chose to buy turkey lunch meat from Tesco (amazing), hummus, bread, and fruit from Tesco, and pack lunch whenever possible. Another option is having a quick lunch at Pret A Manger. There are SO many around the city, and their food is good/healthy and reasonable priced. Master the Tube: I got an Oyster card for the Tube, and I was able to re-charge it. I got the Tube app on my phone, learned that you can’t stand at the left side in the escalators because the country would collapse #sarcasm, and I avoided traveling during peak hours because it was more expensive and too crowded. At the end of my trip, I got annoyed by someone blocking the card-scan machine, and I knew that I was almost a Londoner. Hand sanitizer: I thought that the U.K. facilities were going to be as good/clean as the ones in the US, but I was wrong. Their facilities are much older, and sometimes it was hard/scary to go to a public restroom. Pack hand sanitizer, tissues, wipes and everything you would pack to a third world country because you will need it! 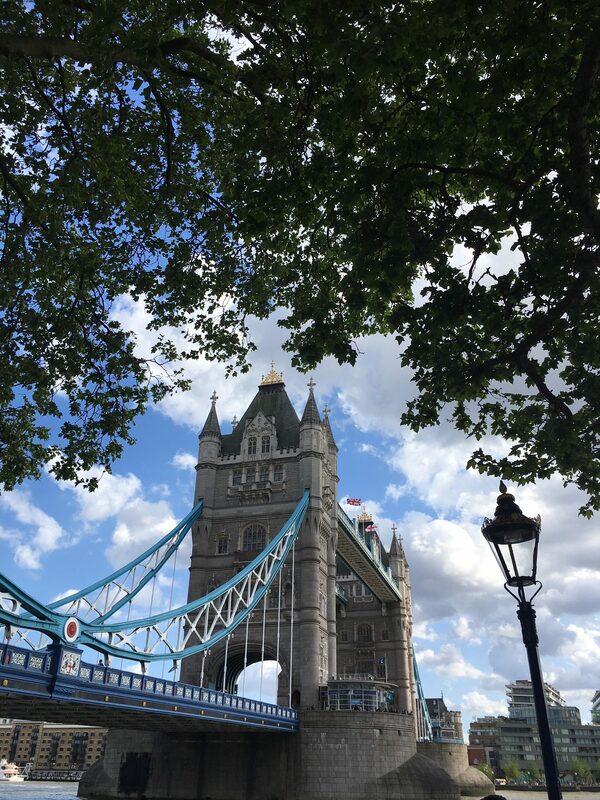 Enjoy your trip to the U.K. London is beautiful and full of so much history! The day trips are amazing, the food is really good, and people are really nice!